A worst case scenario situation can happen before you even arrive at an emergency scene and this is a type of saving our own that is well beyond a rapid intervention emergency drill or event. Performing vehicle extrication and rescue on our own firefighters is a terrible circumstance, but a realistic concern. Vehicle accidents continue to be one of the leading causes of firefighter injuries and death every year. 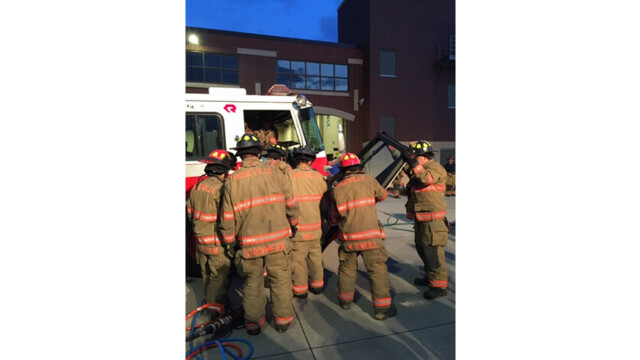 It is imperative for firefighters to obtain a better understanding of different ways to perform rescue of an injured firefighter in a vehicle. Recently the Roseville, Minn., Fire Department had this exact unique training opportunity. 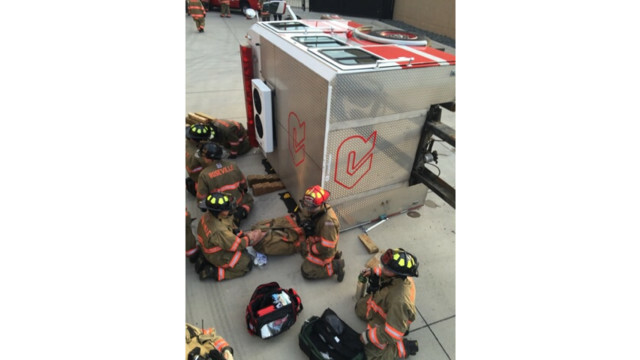 In a great partnership with Rosenbauer America, the Roseville Fire Department was able to obtain a cab and chassis of a fire engine that was to be scraped for metal. The apparatus was a typical fire apparatus cab that was 99 inches wide and constructed of aluminum. A drill of this level has a lot of different moving pieces, and the opportunity to have an apparatus to perform this type of extrication on ramps up your imagination of skills to perform while tempering realistic expectations. We had no shortage of opportunity to perform many different types of rescue on this vehicle, and utilized partnerships with outside agencies as well. We shared EMS duties and skills with our transport agency, Allina Health, and worked jointly with our towing company, Twin Cities Transport & Recovery. Partnering with these outside agencies was a huge asset to both us and them. Fire departments need to continue to look outside their agency to find partnerships with public and private entities to enhance their own response and capabilities; while at the same time training with and learning more about the capabilities and attributes of their partners. The tow company tipped the apparatus on its driver side to initiate our training. While we still had the light of day to perform the evening training, we wanted to focus on rollover, ejection, and lifts as part of the training. For the first two evolutions we used a rescue manikin as the "victim" and incorporated critical EMS care into the evolution by designating an EMS officer to provide crews with specific patient conditions. We had crews performing critical care variances and rescue steps while additional crews performed stabilization and lifting procedures. Utilizing air bags, cribbing, and struts the crews performed a systematic lift of the apparatus to aid in the removal of the ejected and pinned "victim." The initial stages of this evolution were an opportunity to discuss a short game plan and make sure all firefighters were on the same page with the tactics and priorities of the scenario. Once this was completed crews performed at "game day" speed and performance to assure the scenario remained as real-life as possible. It was our goal to have pre- and post- discussion of tactics and priorities, allowing for actual response-ready speed and performance of the individual evolutions. The second evolution allowed for human intervention as we used two fire explorers as patients in the rolled over cab. One was the driver, the other a firefighter in the back seat. Crews performed windshield displacement as well as a door force on the top rear (officer's side) of the cab. Crews used ground ladders to gain access to this area and to assess the back seat patient. It was decided after the door pop that it would be more expedient to backboard and extricate the patient from the rear out the front window. Considerations for patient care during this evolution included assessment challenges with firefighters dressed in full PPE with a donned SCBA. Patient assessment and care in an overturned vehicle is challenging enough, adding bulky PPE and SCBA strapped to your patient only complicated the process. Allowing rescue crews the opportunity to navigate these challenges is vital to patient outcomes during a lengthy or complicated extrication such as this. Once we debriefed the rollover scenarios our tow company demonstrated some of their equipment and capabilities in righting the vehicle to its normal upright position as well as providing valuable insight into stabilization techniques on non-traditional vehicles. 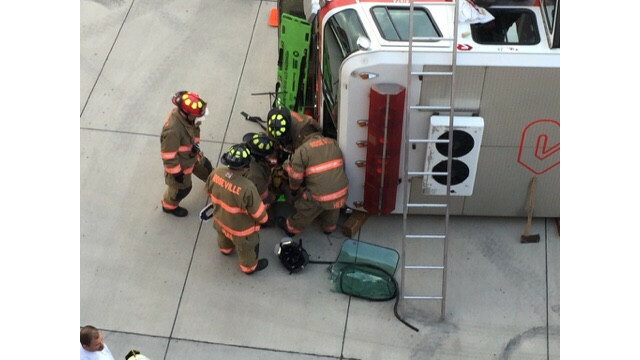 We were able to see how vehicle stabilization can be accomplished using the rotator-style tow truck providing an even safer operating environment for firefighters. Once the vehicle was up-righted, crews jumped right back into a scenario. This was a traumatic accident with two firefighters trapped inside the vehicle, one in the officer's seat, the other in the rear. Forcing a door on this type of apparatus brings many different challenges than that of a personal vehicle. The construction of the cab door, while standard in terms of custom chassis cabs, is dramatically different than that of an automobile door. The height of the door is a challenge our firefighters were not familiar with. A simple door pop proved to be a longer and more physically-involved process. One take away from the scenario was learning that the strap that prevents the cab door from opening too wide was the key to gaining unimpeded patient access. Firefighters learned if they cut this strap right away they could simply open the door completely out of the way. Again, once the doors were forced the patients were removed on a backboard for trauma assessment and transport in the ambulance. Our final evolution was a unique process involving taking off the roof of the apparatus. This project is, without a doubt, easier said than done. Crews were operating with multiple cutting and spreading tools from all sides of the apparatus. One challenge presented with regard to roof removal was the interior support structure that was inside the cab. These support members proved to be a formidable task for firefighters, even causing the failure of a hydraulic cutting tool in an attempt to cut the support member. An after action discussion found the firefighters all agreeing that the team who used the reciprocating saw was the most successful at cutting the cab for roof removal. Communication throughout this entire incident posed several learning opportunities and challenges all at the same time. When completing our last evolution to remove the roof, crews were working on all four sides of the chassis cab, as well as, at times, inside the cab. Trying to keep that many rescue teams on the same page requires a strong incident management structure with an emphasis on firefighters staying focused on their assigned area. One recommendation for managing this scenario would be to assign commanders to each side of the apparatus similar to how you would assign responsibility at a working building fire. While conducting this drill provides firefighters with some valuable, once-in-a-career training, it is hard to replicate the stress and emotion that would be present in a scenario such as this. One recommendation to all fire departments would be to pre-plan this type of scenario. Not only will you need to address the needs of your firefighters who were involved in the accident, but you will need to request resources not only to help with the accident mitigation but also to respond to the original emergency that crews were responding to. On top of dealing with the need to rescue (and treat) firefighters, you will need resources to address any other potential patients involved in the accident and the rescue and extrication needs they may require. And added to all of this, the media will be quickly looking for information from your agency regarding what happened, who was injured, and who was at fault. Take time now to prepare for this scenario and hope you never have to use that planning. The authors will share some more lessons learned in a future article. DAVID BROSNAHAN is a battalion chief with the Roseville, Minn., Fire Department. His primary job is the coordination of the day-to-day operations at Roseville Fire. Chief Brosnahan holds a bachelor of arts degree from Hamline University and a graduate certificate in Public Health Emergency Response from the University of Minnesota. Brosnahan is a certified fire instructor, Live Burn 1403 instructor and a fire instructor with Hennepin Technical College teaching NFPA 1001 and Live Burn training. NEIL SJOSTROM is a career firefighter with the City of Roseville, Minn., Fire Department. He has been with Roseville for the last 10 years in both a part-time and full-time capacity. Neil spent four years with Rosenbauer America�s Wyoming, Minn., division working on the inside sales force designing and building fire apparatus. You can reach Neil at neil.sjostrom@cityofroseville.com.